Duckmandu CD! 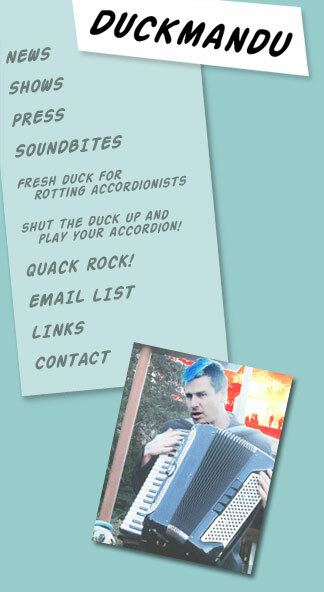 Quack Rock: Five Duckades of Accordion Mega-Hits! 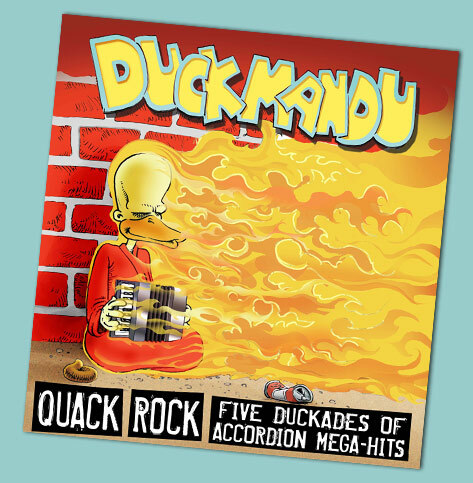 Quack Rock: Five Duckades of Accordion Mega-Hits! Rather than play hokey accordion versions of these songs, Duckmandu/Aaron Seeman seeks to demonstrate that accordion and vocals alone can evoke the spirit of the song, whether the hard driving rock of AC/DC, the wide vocal range and sonic landscape of Boston, or the grunge pioneers Nirvana. In a world that turned against the accordion, they never tired of stealing from its rich bounty of musical innovation. They tried desperately to match its boundless variety of timbres, styles, and harmonies. They created musical "movements": Psychedelic, Punk, Art Rock, Funk-Rap-Rock. These terms encompass entire genres, but each represents but a miniscule portion of the sonic world of the pyrotechnically virtuosic accordio-vocalisticator, DUCKMANDU! Now all may stand awestruck in the presence of the greatest songs from Rock Music History, presented here at long last in their original form. Now available: BUY VIA CDBABY or BUY ON iTUNES!